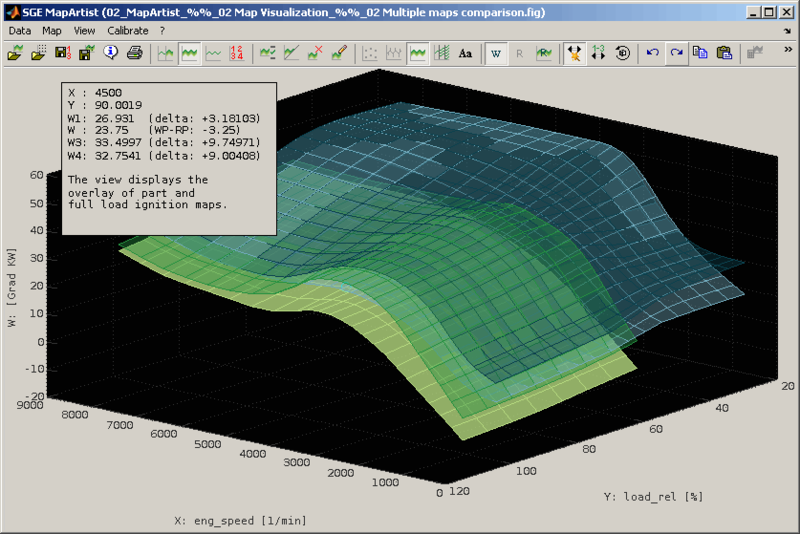 The SGE MapArtist is a tool for ECU map creation, visualization and optimization. This manual gives information about the topics regarding the SGE MapArtist only. The SGE MapArtist is part of the SGE Circus. For help topics regarding general features please refer to the corresponding documentation accessible using the links below. The SGE Circus documentation makes available general information regarding data loading procedure, input handling, preferences, history and other topics concerning all tools. Many functions are quickly accessible via keyboard shortcuts. For a list of available keyboard shortcuts, see the list below. In addition, the entries in the menus and context menus as well as the tooltips of the toolbar point to shortcuts. Swap x/y in 2D view. Toggle standard views, reset axes (2D/3D). 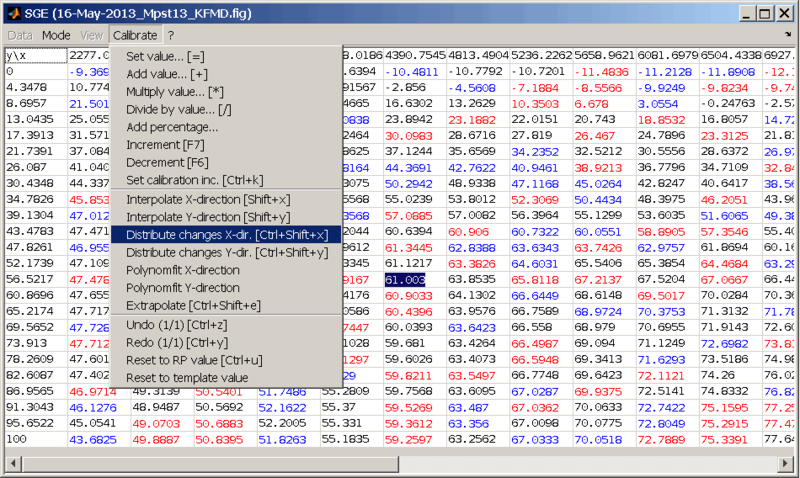 Modify table width (table view). Mark all map points (2D, 3D). 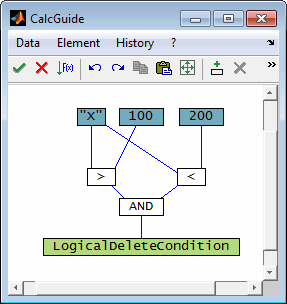 Toggle mark all, map, axes (table view). Copy / paste data to / from clipboard. Additionally it is possible to paste files or strings containing file names to the present to load maps or data points. The main features of the SGE MapArtist are listed in this introduction. For details please see the following sections. Definition of any calculated channels including features like map interpolation and Simulink systems integration. By direct use of filters and calculations, the pre-processing of data can often be eliminated. The whole session including data can be stored. After re-opening the whole functionality can be used again immediately. File size depending on loaded data. All dialog have a history and filters to find former inputs quickly. All dialog offer export and import functionality to load and document inputs. Ready formatted for email or office software. Reports made easy. Axes, fonts, sizes, adjustable. Adding notes, highlights, etc. The main purpose of the MapArtist is to create, visualize and optimize maps. Therefore any number of maps can be loaded or created simultaneously. Exactly one of the loaded maps will be the active map at a time. Only the active map is fully functional. All other maps are just displayed in standard manner. So e.g. only the active map can be edited, marked and copied. Error maps, error lines and iso-contour plots are only available for the active map. A legend can be displayed (Ctrl + l) to identify the active and loaded maps as well as the data point sets. In table view a tooltip will be shown to identify the active map when the mouse rests on the table. Additional maps can be loaded or created (Ctrl + t). See the following section for details. Maps can be duplicated to handle them separately. A counter will be added to the name of the new map. Loaded maps can be deleted if at least one map remains (Shift + del). The active map can be selected from the loaded maps (Shift + 1..6). This can also be done using the menu or double clicking the corresponding legend entry. Data relating to the map is restored when a map is made inactive and active again later on. So e.g. the undo history is selective for the single maps. The visibility of single maps can be toggled if they are not the active map (Ctrl + Shift + 1..6). The visibility of the active map and e.g. the data points and error lines are modified separately using the “View” menu item or keyboard shortcuts. The order of the maps shown in the legend can be modified (Ctrl + Shift + Up/Down). Additionally to using keyboard shortcuts or the menu items most map handling and configuration operations can be performed using the Map Configuration utility (F4). The active map is available as reference and working page. Either the working or reference page can be activated (F8). Additionally the reference page can be made visible while the working page is active (Ctrl + F8). The reference page map is displayed using a dotted line. The working page can be edited. The reference page is write protected. The only ways to modify it is to save the working page as reference page (Ctrl + Shift + f) or to load a new template map with different axes size (Ctrl + t). In this case the template is also loaded to the reference page to keep the dimension of reference and working page map identical. You can also copy the reference page to the working page. The template is the initial map and its axes that is used as start point for the map creation and optimization. Several sources are available to load template maps from. It is also possible to create a new map without using any external source. See the following section for a description of all template generation options. When you load a template map (Ctrl + t) for the first time during a MapArtist session it is made the active map and working and reference page are initialized with the template map data. When you reload a template map (Ctrl + t) different modes are available to add or replace maps or to interpolate maps to new axes. See below for a description of all template load modes. You can load the template map from a DCM, PaCo or CDF file. The file will be asked and you can choose from all map labels in the file. In addition to using the file load dialog, you can load sessions and template data files by using drag and drop or the clipboard. To do this, one or more files can be dragged directly to a MapArtist session or inserted via keyboard shortcut (Ctrl + c / v). It is also possible to copy files directly to the clipboard as well as strings containing the file names line by line. You can create a new template map without using any external source. The map will be initialized with zero values. The map size, distribution type, name and units can be defined. If data points were loaded you can choose "automatic" to get the breakpoint number and values determined automatically to match the data. The distribution can be equally spaced or fitted to the data if any data points were loaded. The name must consist of a-zA-Z0-9_. only with a max. length of 1024 char and must not start with a digit. 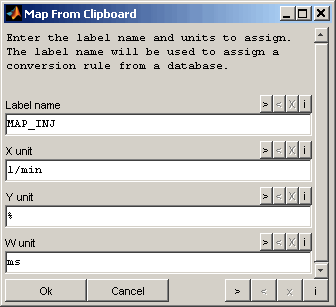 The label name will be used to assign a conversion rule from a database. So make sure to use the exact label name here in case of creating a label to later transfer to a system using conversion rules (e.g. ECU). A map can be retrieved from ETAS INCA software. Therefore INCA must be started and an experiment must be opened. The map will be retrieved from the active calibration page. If you get the map from INCA also A2L information (conversion rule) is collected. This will be used in case the map is saved as DCM later to use the correct group axes, units and to define the conversion rule used while editing the map, e.g. the increment used for incrementation. If you copied a map to clipboard this data can also be used to create a template. The clipboard data can be with or without axes. When no axes are loaded they are created as integer vectors starting at one. Sources for suitable clipboard content are spreadsheet software or calibration software like ETAS INCA (→ Copy all data to clipboard) or MoTeC (→ Export To Clipboard, CSV file). You have the possibility to import maps from other currently opened MapArtists. The maps must be visible in 3D mode. A list of all available maps will be shown afterwards to select the ones to import. If you miss maps to import make sure they are shown in 3D mode in the other MapArtists. In standard mode the maps will be imported using the color from the source MapArtist. Using the corresponding option you can automatically assign colors not yet in use for the imported maps. 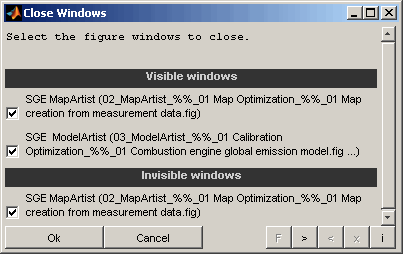 Additionally you have the option to close the source MapArtist windows after import. Make sure to save the work before deciding to do so because the windows will be closed without conformation. In case of interpolating the active map to other axes these can be retrieved from other loaded maps directly. All existing maps in the MapArtist will be deleted before loading the new template maps. Any number of template maps can be loaded simultaneously in this mode. The working page of the active map will be replaced by the template map to load. If the dimension of the new template map differs from the dimension of the active map, also the reference page will be replaced to assure equal dimensions. Exactly one template map must be loaded in this mode. All existing maps in the MapArtist are kept while loading the new template maps. If any of the new label names/sources overlaps with an existing their names will be appended with a counter automatically. The working page of the active map will be interpolated to the axes of the template map to load. The values of the map to load are irrelevant in this case - only the axes data will re regarded. If the dimension of the new template map differs from the dimension of the active map, also the reference page will be replaced to assure equal dimensions. You can choose to transpose the template map to load. In this case the x- and y-axes are swapped also. This option is only valid when loading a template from any source. It is ignored when creating a new template. No A2L information will be retrieved in this case. Different targets are available to export the active map to. These are file formats like DCM/CDFX and CSV file (suitable to import into MoTeC software), MATLAB scripts (*.m) as well as direct transfer to ETAS INCA software. Of course data can alsi be transferred using the clipboard. In case the map to save to DCM/CSV file or ETAS INCA software contains invalid values (NaN) you will be asked for a replacement value. Leave empty to keep the invalid values. The working page label can be saved as calibration parameter file (*.dcm, *.cdfx, *.dcmap, *.csv, *.m) (Ctrl + s). The *.m format supports to generate a MATLAB script file to transfer the calibration parameters into the MATLAB/Simulink workspace. 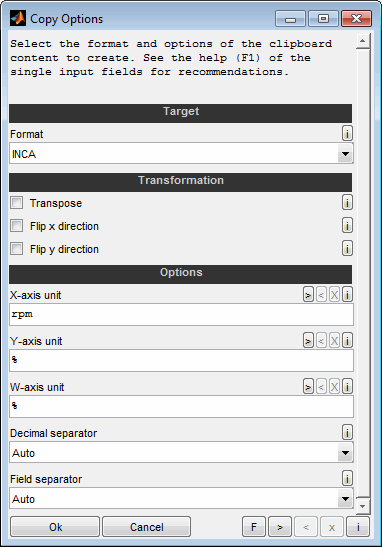 The CSV file has a format suitable to import into MoTeC calibration software. Choose whether to include the complete comment from the "Data → Info" as label "Comment" into the file. You can enter an extra comment here that is additionally saved as label "Comment" to the file. Select the name for the label to create and to save into the file. Default is the name of the loaded template label. Several A2L options are asked when saving to calibration parameter file and “Apply A2L settings” is checked . This is needed if the file should be conform to the description file of the ECU. The correct group axes are especially important, because otherwise the axes will not be loaded by the calibration software even if they are saved with the map. The values are prefilled if this information is available for the label name. They will be retrieved when loading a template map from ETAS INCA software or from an internal database. 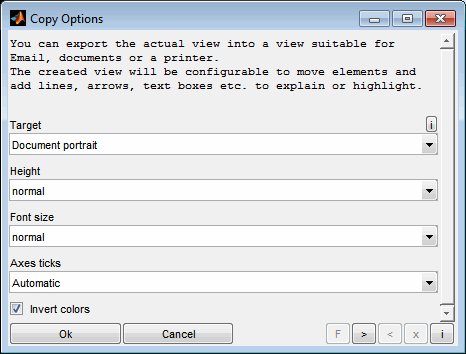 Therefore it is especially important to set the correct label name in the options dialog. Even if you decide not to apply the “Apply A2L settings” any group axes information available (e.g. if label was loaded from calibration parameter file) will be maintained and transferred to the new file to save. If the information from this dialogue does not match the information already linked to the map you will retrieve a warning to confirm the replacement of the properties. 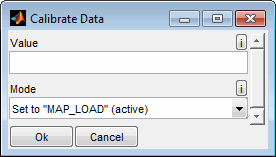 This may for example happen if you load a template map from a calibration parameter file while the previous dialog is filled from the database or if you choose to save to a different label name. If the project of the label in the database does not match the one of the calibration parameter file, some properties may be different. It is important to check the properties to replace because otherwise data errors in the file may happen by applying wrong properties like group axes. 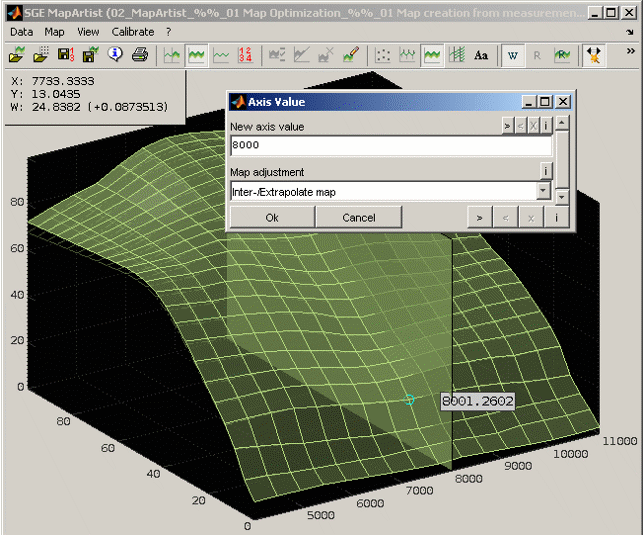 A map can be saved as a MATLAB script (*.m). 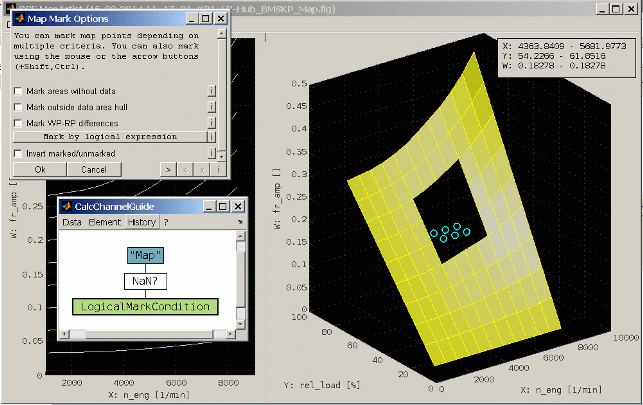 When this script is executed in MATLAB, the map and its axes are created in MATLAB workspace and are available for calculations and simulation in MATLAB and Simulink. Decide whether you want to generate the parameters as numeric variables (e.g. 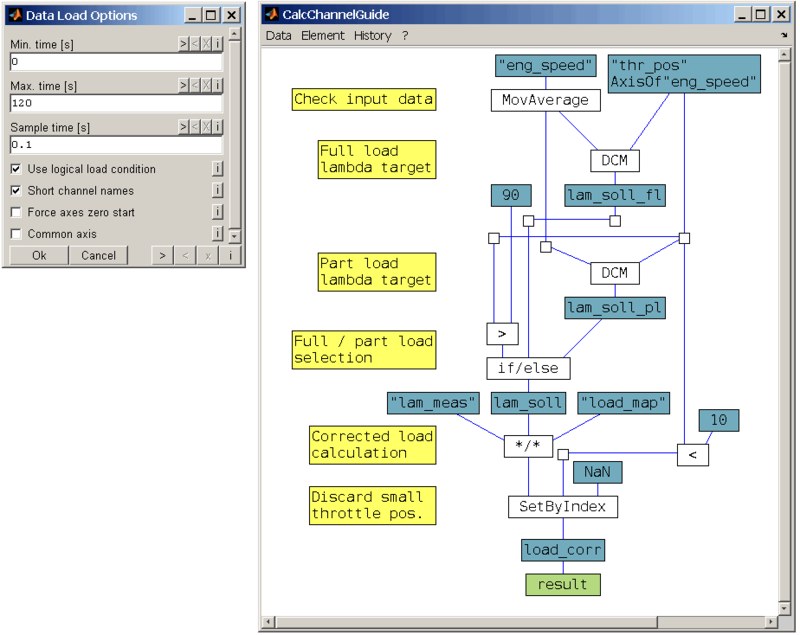 scalar, curve, map) or as Simulink.Parameter type. Decide whether you want to set the storage class for the created parameters to ExportedGlobal. 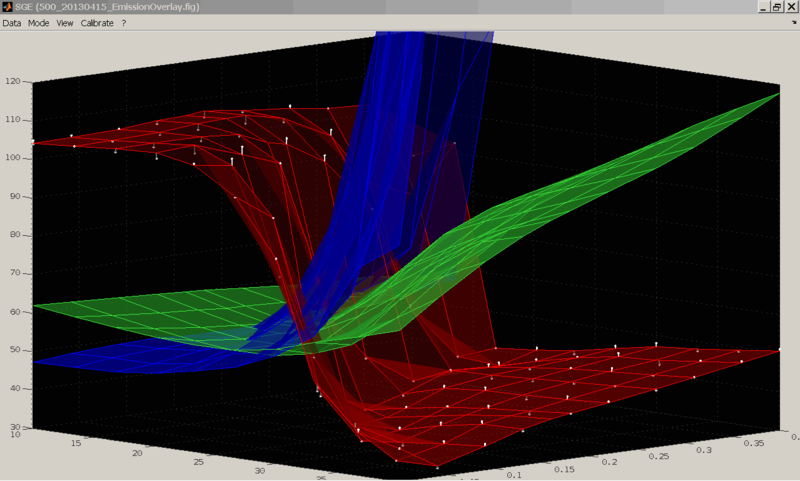 This is only possible for Simulink.Parameter type. You can append any text before or after the name of the parameter. Basis is the name as it was loaded in CompareArtist. Typically this field is empty to not change the name. You can append any text before or after the name of the X/Y axis. Basis is the name as it was loaded in CompareArtist. This field typically should not be empty to make sure to have an individual axis name differing from the prameter name. You can append any text before or after the name of the 3. and more axes. Immediately after this text, a number is automatically appended which represents the number of the axis. The number depends on the following settings. This field typically should not be empty to make sure to have individual axes names differing from the parameter name. You can append any text before or after the name of the parameter. Immediately after this text, a number is automatically appended which represents the number of the axis. The number depends on the following setting. For the third and following axes, a number is automatically appended to the text of the previous setting. Decide here which number is used for the third axis. All following axes will then have correspondingly higher numbers. You can use replacement rules for the parameter names. One rule per line. The string to look for and the replacement are separated by two colons, like "Map :: Table". The replacement is case sensitive, done in the order of lines from top to bottom and after appending the prefix/postfix. Make sure to generate valid MATLAB variable names. If enabled the replacement for a parameter will be aborted after the first rule leading to a change. Otherwise all replacement rules will be applied sequentially. If enabled the replacement patterns are interpreted as regular expression. 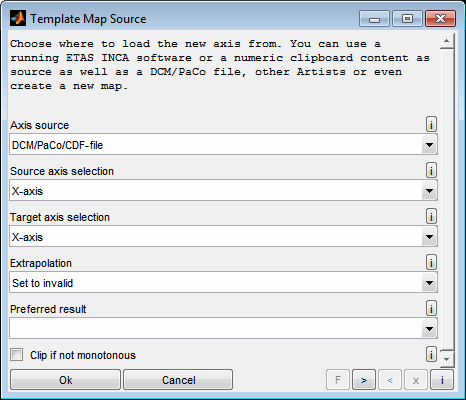 The working page map can be sent directly to ETAS INCA software (Ctrl + s). Therefore INCA must be started and an experiment must be opened with the working page active. Before sending the map to INCA it has to be verified that no function, which is relevant for secure operation, might be influenced. Do not send data while INCA is connected to ECU hardware or a vehicle / engine. When copying the map+axes (Shift + w) the clipboard format is suitable to paste into different target formats. Some options are additionally available to configure the output to your needs. Use this format to exchange entire maps with axes between multiple instances or maps. Additionally the clipboard content can be used to interpolate a map to its axes. See “Load / replace template maps” for details. Use this format to create clipboard content to paste into a spreadsheet software. Similar format like ETAS INCA "Copy all data to clipboard" feature. It is not possible to insert a map with axes in INCA at once. The values and axes must be transferred one after the other by copying and pasting. Use “Copy map” to copy the map values in 2D or 3D view or use keyboard shortcuts to select and copy the map. To select and copy axes values you have to switch to 1D table view. Use this format to create clipboard content to import in MoTeC software using “Import From Clipboard” feature. Remember to also enter the units and choose “Auto” for decimal and field separator or select the corrects values. Choose to transpose or flip the map before copying. For "MoTeC" format you need to enter the correct axes units. Choose the decimal separator for numbers to use when copying to clipboard. Use "Auto" for automatic detection depending on "Target". Choose the field separator to use when copying to clipboard. Use "Auto" for automatic detection depending on "Target". The working page of the active map can be interpolated to the axes of a template map to load. The values of the map to load are irrelevant in this case - only the axes data will re regarded. If the dimension of the new template map differs from the dimension of the active map, also the reference page will be replaced to assure equal dimensions. 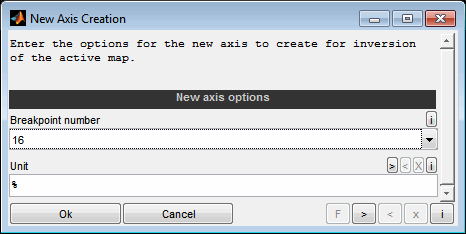 The procedure and options to load the new axes are similar to “Load / replace template maps”. The working page of the active map can be inverted by tilting the map - one of its two axes is swapped for an axis corresponding to the w-values of the map. You can load the template map containing the axis from a DCM, PaCo or CDF file. The file will be asked and you can choose from all map labels in the file. You can create a new axis without using any external source. When no template map was loaded the axis for map inversion is created by specifying its breakpoint number and unit. A map can be retrieved from ETAS INCA software. Therefore INCA must be started and an experiment must be opened. The map will be retrieved from the active calibration page. If you copied a map to clipboard this data can also be used to create a template. The clipboard data must be with axes. When no axes are loaded they are created as integer vectors starting at one. Sources for suitable clipboard content are spreadsheet software or calibration software like ETAS INCA (→ Copy all data to clipboard) or MoTeC (→ Export To Clipboard, CSV file). The axis can also be retrieved from other loaded maps directly. Decide which axis should be used from the "Axis source". The axis must correspond to the X-axis of the active map. For example, if you want to invert a map representing the torque over speed and load, the loaded axis must be a torque axis. Decide which axis of the active map should be replaced by the axis from the "Axis source". In this way, you determine the direction of the inversion. If the inversion is understood as tilting, you decide here the direction of tilting. For example, if you want to invert a map representing torque (w) over speed (x) and load (y), you have two options. 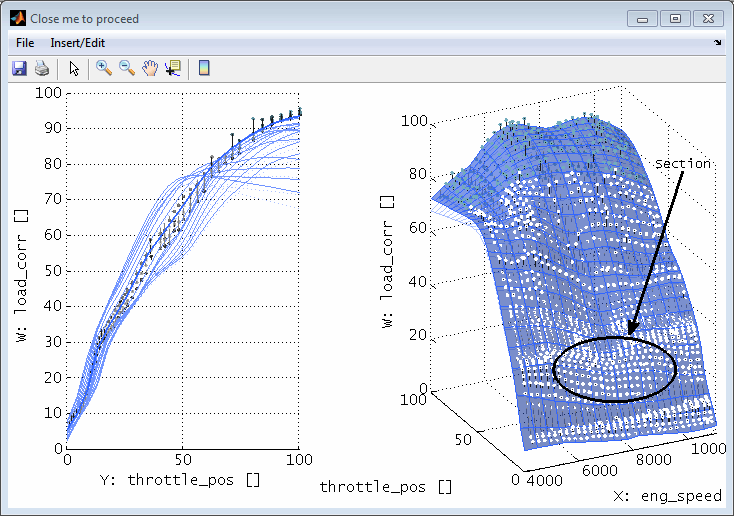 If you want the result to be a map showing the load over speed and torque, select "Y-axis" as the target axis. 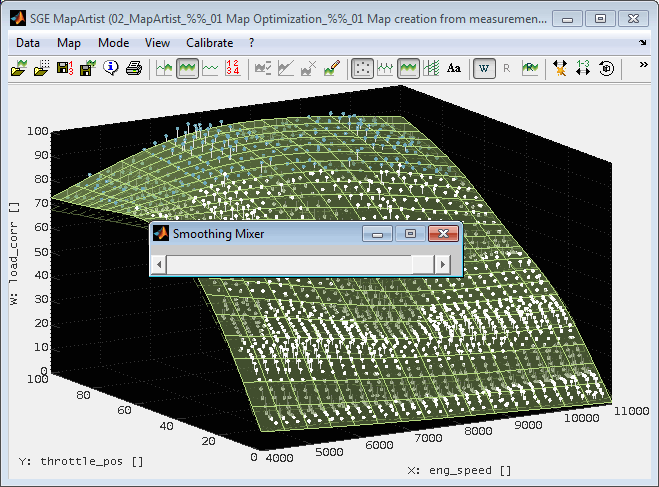 If you want the result to be a map that shows the speed by load and torque, select "X-axis" as the target axis. Decide how to handle points outside the axis areas. Default is to set the values to invalid (=NaN). You can also decide to keep the nearest value from the map or to extrapolate. If the map is not monotonous, the inversion is not unambiguously possible, as there can be several solutions. In this case, you can decide whether you want to use the smaller or larger result. This option is relevant for all points of the new axis that are above the map to be inverted. Checked: For values to be inverted above the map the axis value corresponding to the maximum is determined. Unchecked: The last axis value is determined for values to be inverted above the map. Measurement data points are loaded to give the course of the map to create or to be displayed together with the map (Ctrl + o). This data may be scattered and must not be arranged to the map breakpoint values. The data loading procedure is explained in the documentation of the SGE_Circus as it is common to all tools. We recommend that you read that section first as useful features like sample reduction, logical load conditions and calculated channels are explained there. When loading data (Ctrl + o) you will be asked for files and channels to load. Normally you will choose three channels containing the x, y, and w values of the data points. You have to activate the “common axis” feature to ensure the equal number of x, y and w values. Calculated channels and the logical load condition can be used to load exactly the data you need. The data points are organized in data points sets. Any number of data point sets can be loaded simultaneously. You can edit the color and description of the data points sets and switch their visibility (Ctrl + EnterData properties). Anyway even invisible data points take place for map optimization, smoothing and all other operations. In addition to using the file load dialog, you can load sessions and data files by using drag and drop or the clipboard. To do this, one or more files can be dragged directly to a MapArtist session or inserted via keyboard shortcut (Ctrl + c / v). It is also possible to copy files directly to the clipboard as well as strings containing the file names line by line. In case data points are already loaded the options for the data loading process like filename, sample rate and calculated channels will be proposed to easy replacing data. When multiple data point sets are loaded the first active one will define the options to propose. So when you need to get the settings of a specific data point set you can deactivate (Ctrl + Enter) all other to simplify the data loading process. After loading the data and a template map you will be asked to the data correlation. Choose which channels loaded to use as x, y and w values. If you loaded a template map and do not want to create a new one the template axes ranges are shown to ease the choice. In case data points are already loaded you will also be asked whether you want to replace them or to append the newly loaded data points. In case of adding data you will be asked to select a color for the new data point set. In case of replacing you have the option to only replace a single data point set instead of all. If the loaded data contains NaN values these points will be removed automatically. If you loaded a template map and do not want to create a new one you can alternatively load only two data channels. The third one is then interpolated from the active map. This feature is used to just display the operating area of the data file in the map. You can delete part of the loaded data points (Ctrl + d) that you don't need or want for map creation for example to remove spikes. You can either double click onto a data point or use the menu. You can delete data points if they are far away from the map. Define the distance threshold here either as absolute or percentage value. E.g. 2 or 2%. Leave this field empty if you don't want spike deletion. The following picture gives an example for “Delete all points between xaxis 100 and 200”. Leave the calculation empty if you don't want logical deletion. It is possible to delete entire data point sets. All conditions are combined with OR. So if at least one of them applies the point will be deleted. 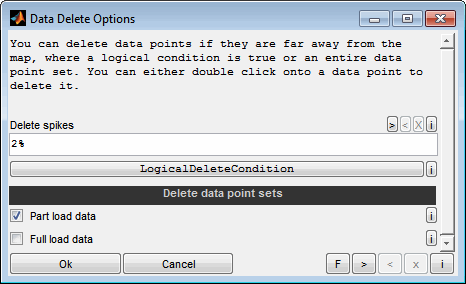 Before deleting the data points a confirmation dialogue will be shown and the points noted for removal will be shown colored red. Rotation and zooming is enabled while the confirmation dialogue is present. When a big number of data points will be deleted no red markup will be shown to avoid slowdown of the display. 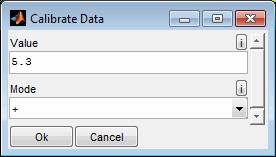 When loading data points you can select to replace the existing data or to add to it. In the second case multiple data point sets will be created. Each set can have an individual color and description. Both can be modified (Ctrl + Enter). It is also possible to make single data point sets invisible. Anyway even invisible data points take place for map optimization, smoothing and all other operations. The dialog additionally enables to edit the color of the marker points. The files the data was loaded from is remembered and will be used e.g. 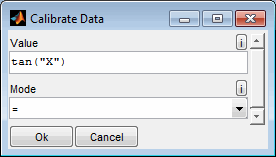 to prefill the dialogs when reloading data. They can also be displayed using the data info ((Data) Info). It may happen that files have been renamed or moved during the work or after reloading a session. Use the “Check files” option in this case to search the missing files and update their names and path automatically. Remember that sometimes it is not possible to find missing files. Especially all files must be located in the same directory. The option “Continue + Remember” allows you to save search results and apply them quickly next time without prompting. To reset these saved replacements, the software must be restarted or the corresponding option must be used when the message after automatic replacement is displayed. You can display some information about the loaded data and maps (Fehler: Referenz nicht gefunden) like file names, comments, axes details, data loading / map history and calculated channels. This may be helpful to document the work done. Calculated channels will be shown by opening them in the CalcGuide. This is just for display purpose. Modifications done in the CalcGuide will be discarded. The data can be copied to the clipboard. The MapArtist window has three main views – 3D, 2D and a table view. The 2D and 3D view can be shown simultaneously in a split mode. Switching between these modes can be done quickly using the keyboard shortcuts (Ctrl + 1, Ctrl + 2, Ctrl + 3, Ctrl + 5). The view can be adjusted quickly by using mouse and keyboard shortcuts or the mouse – e.g. zoom (Ctrl + + / -, Mouse wheel) and rotate (Ctrl + Arrow, Ctrl / Shift + mouse wheel). The axes labels and title can be modified. The axes labels are not always visible to maximize the view of the map if “Maximize axis area” is activated. 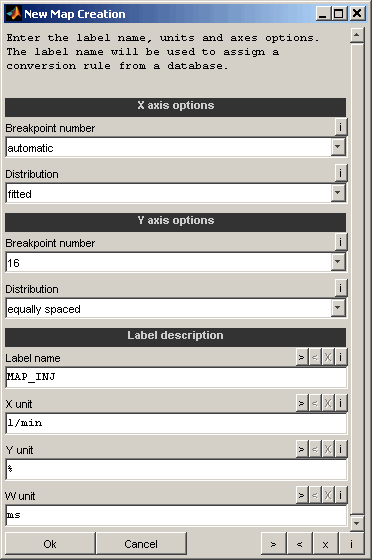 Also the axes ranges can be modified and the axes ticks can be forced to accord with the map breakpoints (Ctrl + x). If “Axis auto” is checked in the menu the ranges will be chosen automatically. In 3D mode different display elements are available and can be individually activated. The map color, transparency and light source are configurable. If you experience problems with the graphics display on some graphics hardware you could try avoid 0% transparency. Otherwise you will need to adjust the SGE Circus general graphics setting. The number of lines or contour values and the display of values near the lines can be defined using the “Display options” menu item. The error lines connect the data points to the map and ease the judgment of their deviation. Above the map they are colored white and under the map gray. Predefined standard views are available and can be toggled quickly using shortcuts (Ctrl + F12, Ctrl + r). It is also possible to adjust only the view without resetting the axes ranges (Shift + F12, Shift + r). 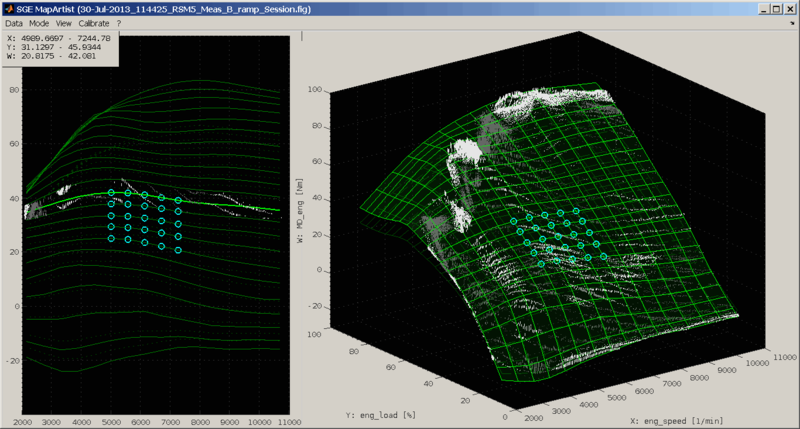 Similar to the 3D mode the displayed elements are the map, data points and error lines. The view can be swapped between x and y axis (Ctrl + 2, Ctrl + 5). The number of breakpoints to show in display direction upright to the screen can be configured (Shift + n). Only the active label defines the breakpoint values in this direction. All other labels are interpolated to the breakpoint values of the active label. So for example when the 2D view is set to show the x axis, the y axis values to show are retrieved from the active label. The other labels are displayed interpolated to these y axis values while the x axis values remain individually for the single labels. The lines are also colored white and gray. The data points are colored accordingly to the distance from the screen. This allows to judge their relevance for the actual breakpoint. The max. distance of data points to display can be selected using the corresponding menu item. In table view different view modes are available. You can choose between different combinations of values, differences and relative differences (Ctrl + 1). The differences between working and reference page are displayed in terms of color. Red indicates working page values bigger their reference page value and blue vice versa. The axes can be edited comfortably since monotony is only checked when the table view is exited. Remember that when the calibration rule is applied automatically, then axes monotony must be correct at any time. Turn off the automatic calibration rule application if you want to allow not monotnous axes temporarily. The decimal places of the numbers to show can be modified. The setting is just for display purpose and has no influence to the data values itself. The column width can be adjusted quickly to data changes using keyboard shortcuts (Ctrl + F12). Additionally a general setting can be used to define the extra space added to each column in terms of clear arrangement. Depending on the selection in the menu either the working or reference page map is shown (F8). Additionally the reference map can be shown as a transparent background map with dotted lines while the working page is active (Ctrl + F8). Choose the grade of transparency and the color in the corresponding menu. By default the color is kept equal to the working page map color. 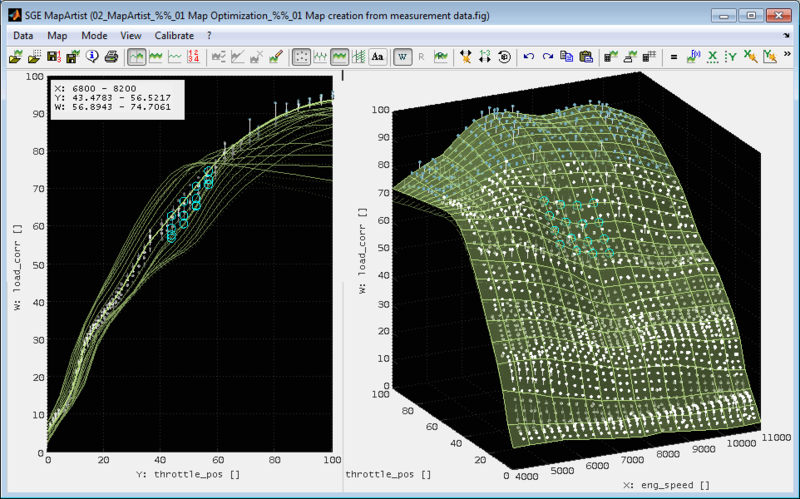 To accelerate the display a sample reduction factor for the data points is used in 3D and 2D mode. 10 e.g. means that only every tenth data point is displayed. The option does not influence the created label. It is only used for displaying the data samples. "Automatic" means to automatically adjust the display reduction according to the performance of the computer. “Automatic” is on by default. To use a specific data display reduction use the corresponding keyboard shortcuts (Ctrl + Shift + / - ). Once a specific reduction was chosen is remains active until automatic detection is reactivated (Ctrl + Shift + F12). It is also possible to enforce a specific reduction using the “Display options” menu item. Using the “Display options” menu item enables to modify some display setting. 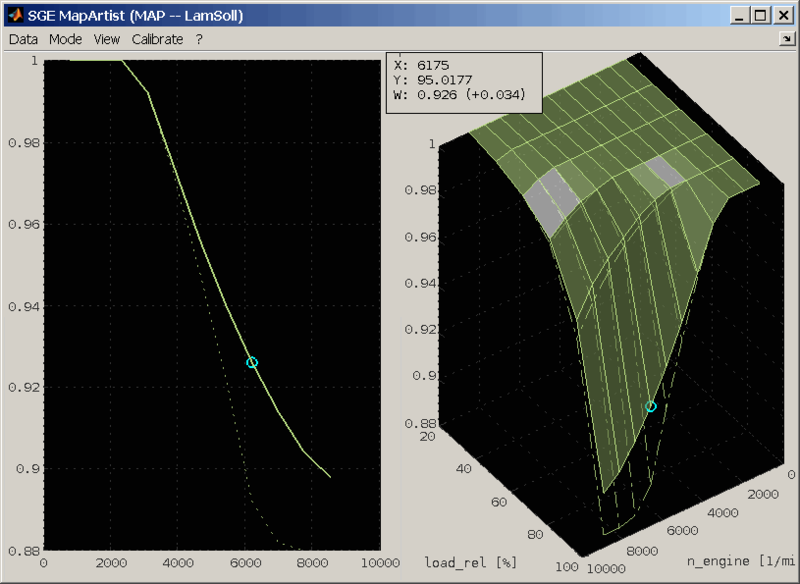 It is possible to enforce a specific sample reduction as well as to configure the iso-contour plots. “Automatic” is on by default. To use a specific data display reduction use this option or the corresponding keyboard shortcuts (Ctrl + Shift + / - ). Once a specific reduction was chosen is remains active until automatic detection is reactivated (Ctrl + Shift + F12). 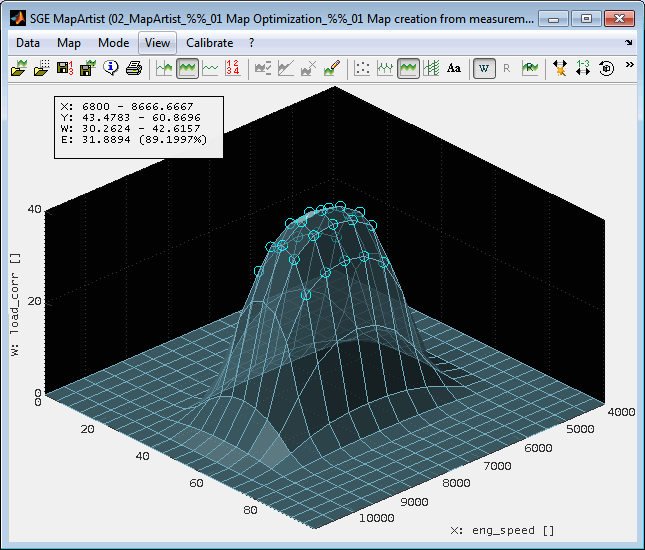 The iso-contour plot can be customized. Enter a number here for the number of contour lines or a valid Matlab vector syntax for the values of the contour lines. 20 : Create contour plot with 20 lines and automatic values. [100:20:200]: Create a plot with lines from 100 to 200 in steps of 20. [100:20:200 300:100:1000]: Create a plot with varying step size. 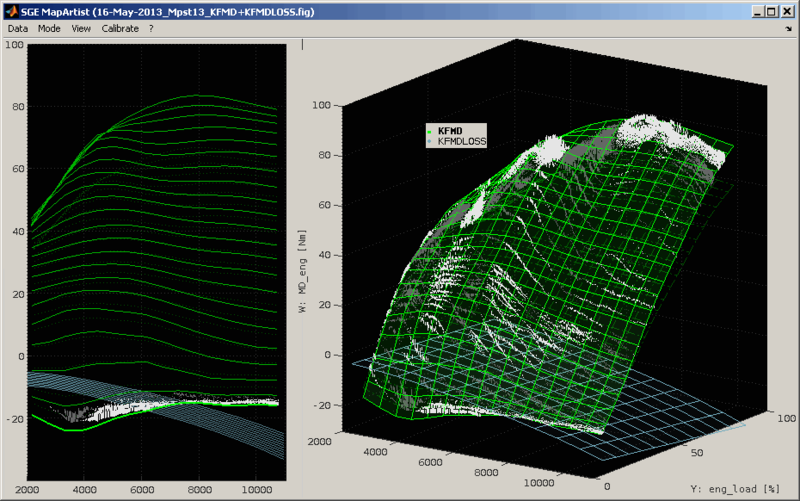 Many lines for the contour plot will slow down handling of the graphics. These definition is used for the data and error contour plot. 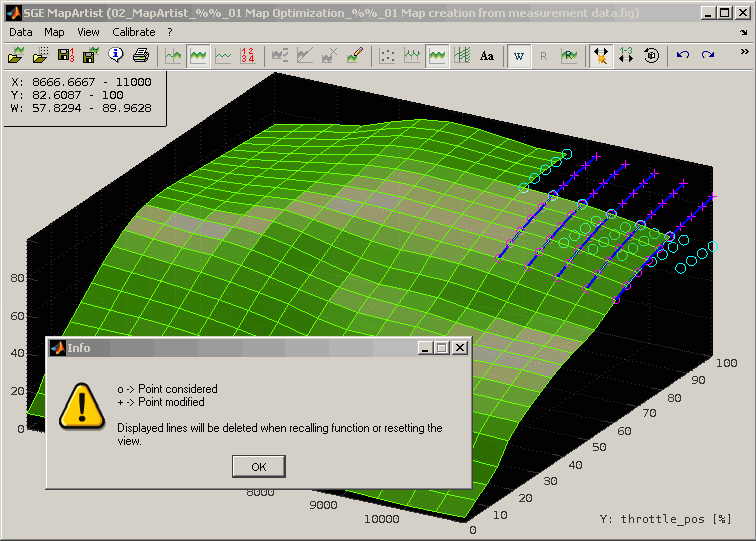 This option does apply to the iso-contour plot as well as to the error iso-contour plot. 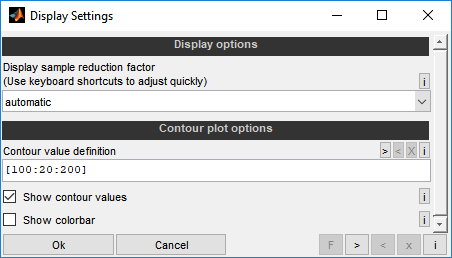 Activate this option if you want to display values next to the contour plot lines. 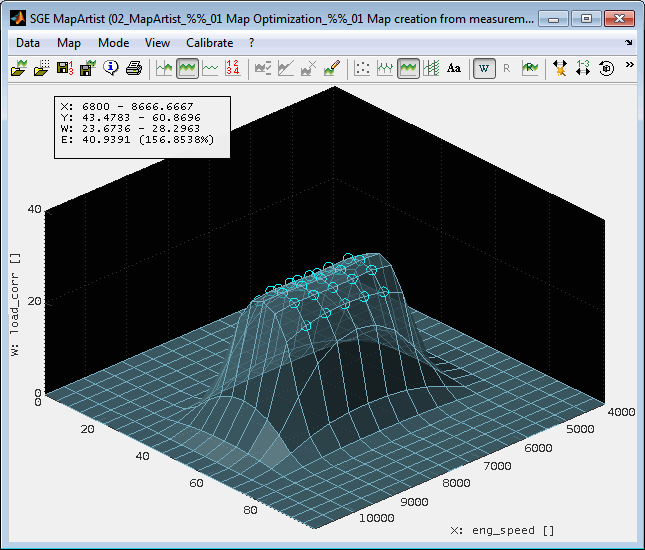 This option does apply to the iso-contour plot as well as to the error iso-contour plot. 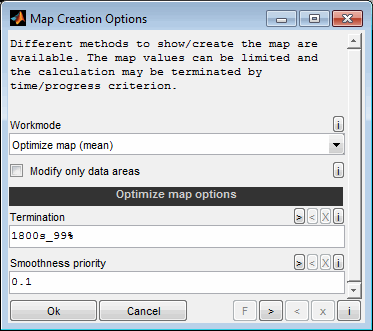 Activate this option if you want to display a colorbar indicating the correlation of the map values and its color. Using the corresponding menu item enables to adjust the background color of the 2D and 3D view. Map values can be marked and will be highlighted then. This can be done using the mouse (Ctrl + Mouse button,Shift + Mouse button), keyboard and the menu function. Arbitrary map areas in 2D and 3D view can be marked/unmarked wiping the mouse while Ctrl key is pressed. 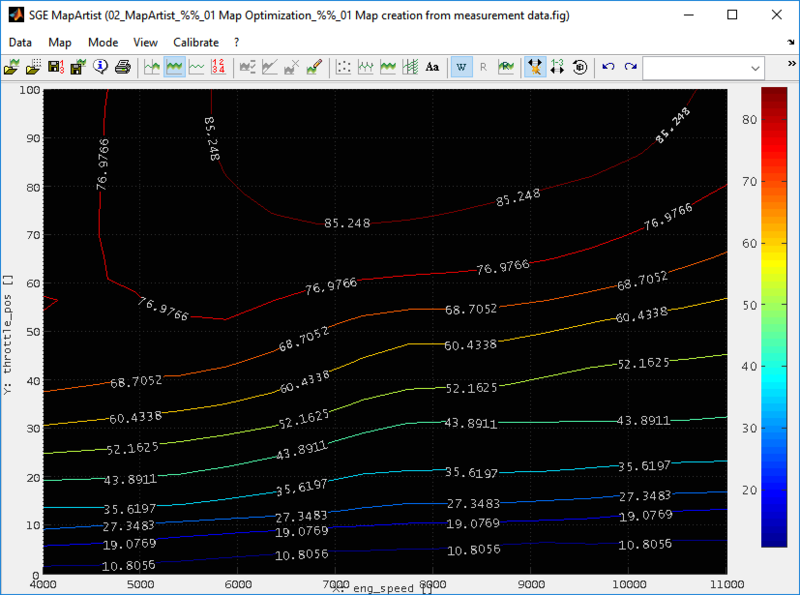 The color of the marks can be edited using the feature to edit the data point set colors (Ctrl + Enter). When points are marked several functions will ask to operate on the marked or all points when executed. Using the menu function (Ctrl + m) enables you to use mark algorithms. You can mark map points where no data points are nearby. This method may create "holes" in the map if there are no data points nearby the map breakpoints. You can mark map points outside the data area. The data area is regarded as a convex hull around the data points. This method avoids to create holes in the map. You can mark map points that differ between reference and working page. You can mark map points that are invalid (NaN value). 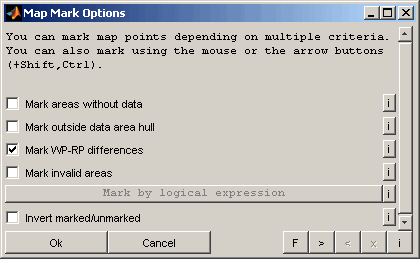 The following picture gives an example for “Mark all points with map values between 1 and 2”. You can finally invert marked / unmarked points. The inverting is done after all other mark actions. The different mark methods are combined with OR. When map points are marked a cursor view is activated in the top left corner. The position of the cursor view can be modified by dragging it with the mouse. It displays the values of the current point or current range if multiple points are selected. Also the difference working to reference page and absolute / relative error referenced to data points is shown. In case multiple labels are loaded their difference to the active label is shown. The cursor can also display an individual text below the data values. Use the corresponding menu item or double click the cursor to edit the individual text. 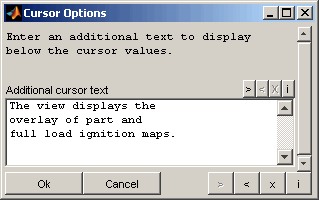 Remember that the cursor and therefore the individual text will only be displayed when map points are marked. The main target of the MapArtist is to create a plausible map that matches the data points. 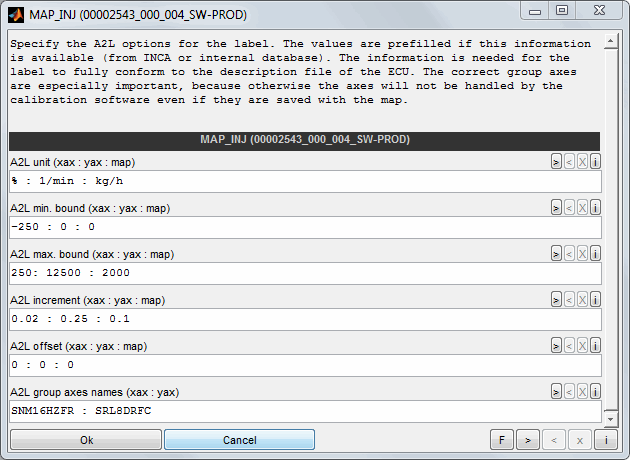 Therefore a set of functionality is available to create and smooth the map and axes distribution. When points are marked you will be asked whether the operations should be done for all or only the marked map points. The map calculation (Shift + c) generates the map values to fit the data points using multiple algorithms. 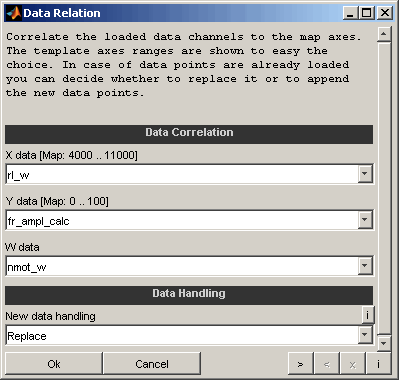 Thus the map calculation can only be performed when data points are loaded. The data and the map will only be displayed and not changed e.g. to judge the error or create an iso-contour plot. This mode is very quick. But without the optimization the map is more a quick guess than a good fitting map. With optimization the map is fitted as good as possible to the data. Special methods to treat areas without data are used. The optimization progress is shown graphically and can be interrupted at any time. In this case you can choose to use or discard the intermediate result. The direction of optimization can be chosen between mean, which means that the map fits the data points best and direction above or under, which means, that the map will be optimized to hull the data points. The map is created by optimizing a Gaussian Process Model to fit the data' points. A Gaussian process model is a statistical model, where a set of variables associate the axes values with a stochastic distribution of the map value. In general this is suitable to fit arbitrary map shapes with reduced risk of overfitting. As the optimization is very resource extensive the calculation may last very long or even be impossible. During optimization a progress bar is shown. By closing it you can abort the optimization prematurely or change a trade off level between accuracy and speed. In general you should prefer accuracy. A plane is fitted to the data. The order can be chosen. If points are marked in the map only the marked points will be calculated or optimized. You can choose if you want to calculate the whole map or only ares where data points exist. The data area is regarded as a convex hull around the data points. This option is only valid for the "Optimize map" modes and must be empty for all other modes. During smoothing a progress bar is shown to judge the progress. The progress shown corresponds to the remaining deviation from the map to the data points. In practice the deviation will not be reduced to zero because the map will not be able to fit the data points perfectly as the breakpoint number is limited and data points are influenced by measurement tolerances. So the waitbar will stabilize at any value but not reach 100%. The map view will be updated regularly during optimization to judge the progress. When the result is satisfying the entire optimization process can be terminated by closing the waitbar window. It specifies the priority to consider for the smoothness of the map during optimization. 0 means to fit the map to the data points as good as possible without regarding its smoothness. Higher values increase the smoothness of the map at cost of its accuracy to fit the data points. A value of 1 means approximately the same priority of smoothness and accuracy. In general the value should be as small as possible. Values of about 0.1 may be a suitable starting point. There is no need to enforce the desired smoothness of the map by using high values for this option because separate map smoothing algorithms are available. See the following section. After calculating a map it is generally a good practice to process some smoothing (Shift + s). Mostly it is possible to get more plausible maps without increasing the deviation to the data points too much. When points are marked you will be asked whether the operations should be done for all or only the marked map points. Generally spoken the best smoothing settings must be evaluated for every use case. Around the map a "corridor" will be created with the width of the chosen range. Then the smoothest possible map inside this corridor is created. This methods always tries to straighten the map and may change the course of the map. It is recommended to apply a "Max. allowed error increase" if data points are loaded. The corridor range entered here can be relative or absolute. If the value ends with % it is regarded as relative in percent of the map value. This may lead to unwanted behavior if the map values are close to 0. Use together with the "Max. allowed error increase" option. Corridor smoothing only tries to smooth the map in the directions that are activated. You can limit the error increase due to smoothing to a certain value. This is a very powerful option to retrieve smooth maps without changing the main map course. 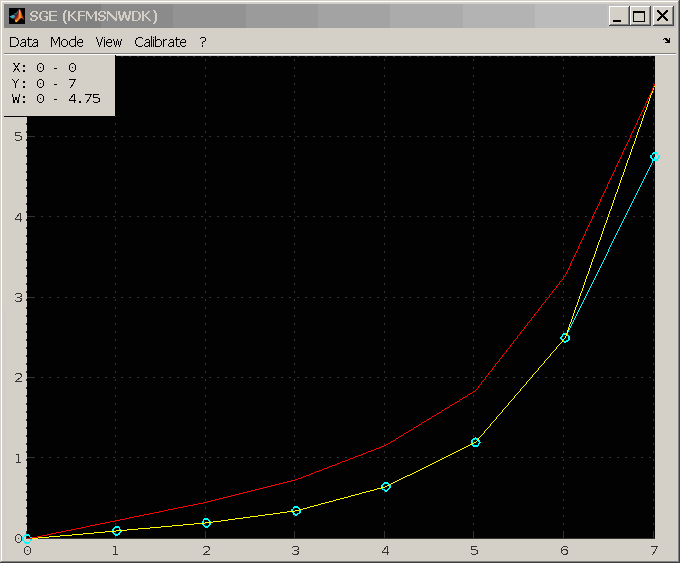 This option enables to use big or even unlimited “Smoothing corridor ranges”. The value entered here can be relative or absolute. If the value ends with % it is regarded as relative in percent separately for each map point. This may lead to unwanted behavior if the map values are close to 0. E.g. 1% means that every map point can be modified by the algorithm to get a smoother map until the mean absolute error increases by 1% of the map value. Without % it is regarded as an absolute value in units of the map. The values entered here do not have a quantitative meaning. Due to calculation strategies 1% error increase will not exactly be 1% of the map value. The right value to use must be evaluated for every use case. Generally it is recommended that areas outside the data are adjusted roughly before smoothing with error limit. This can be done by marking only this area and smoothing without error limit first. The axis directions to smooth in can be chosen. If you experience unsatisfying smoothing results you may try to smooth only one direction or both directions sequentially. The vertical W preference of smoothing can be chosen between "mean", which means that the map fits the data points best and direction "above" or "under", which means, that the map will be smoothed to hull the data points. This option will only have an effect if data points are loaded. You can choose if you want to smooth the whole map or only ares where data points exist. The data area is regarded as a convex hull around the data points. 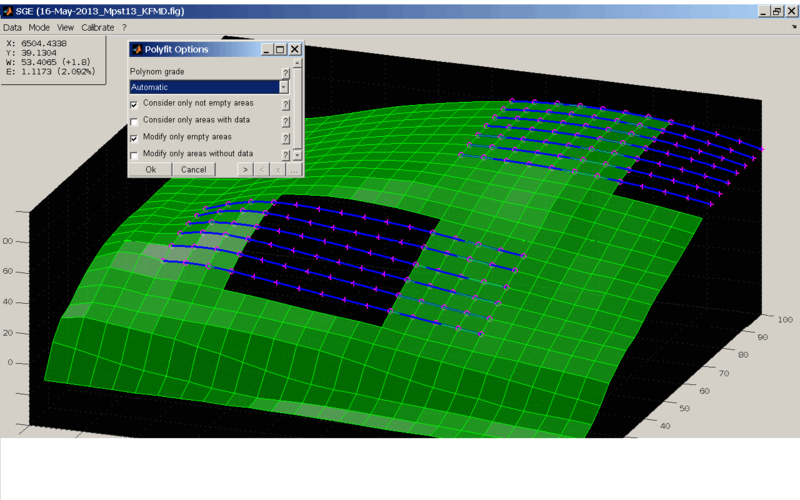 Activate this option if a even connection to the neighboring areas should be created for partial smoothing. If this option is deactivated, the area to will be smoothed without taking into account the transition to the other areas. 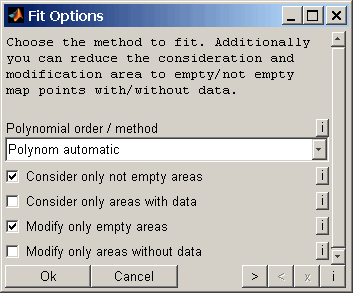 This option is only relevant if parts of the map were selected before smoothing or if the area to be smoothed was reduced by the “Smooth only data areas” option. The following two figures show the influence of this option. With active option (left) the smoothed area has an even transition to the neighbouring areas. Without the option (right), this transition is not taken into account and is therefore not smooth. During smoothing a progress bar is shown. Because the smoothing process is split into different phases with different proceeding you will recognize that the progress shown is not linear. The waitbar will speed up and slow down alternately. When it stops for too long you have the possibility to skip to the next phase by closing the waitbar window and choosing the corresponding option in the dialogue shown afterwards. The map view will be updated during smoothing to judge the progress. 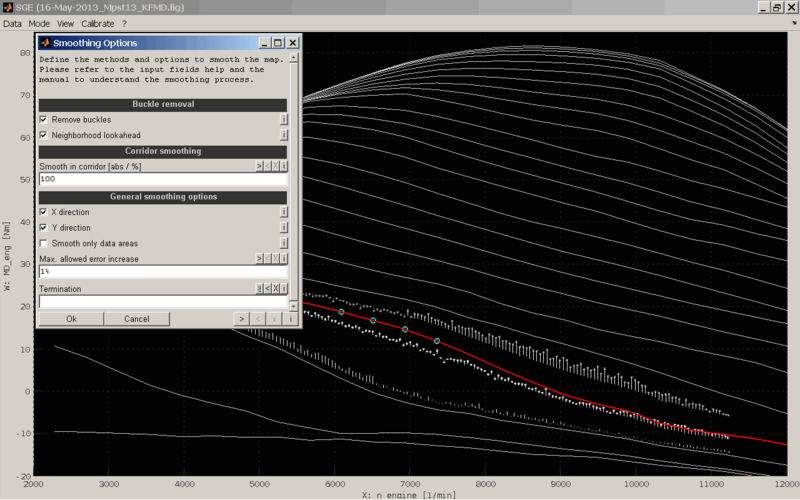 When the result is satisfying the entire smoothing process can be terminated by closing the waitbar window. After termination of the smoothing the map points that were restricted to smooth by the corridor width or the error criterion will be marked to be able to judge the smoothing options chosen. These marks will be removed when resetting the view, recalling the function or using the following mixer. A mixer will be shown after finishing the automatic smoothing to balance the smoothing result between the initial map before smoothing and the map resulting from the automatic smoothing process. The axes optimization is used to modify the axes breakpoints in a way that the map fits the data points in an optimal way (Shift + a). 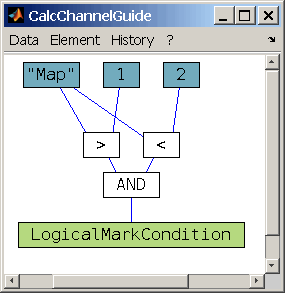 Thus the map calculation can only be performed when data points are loaded. The axes optimization can be restricted to single directions and breakpoint ranges. You can limit the time for the axis optimization. Define as string ending with ''s''. E.g. : 10s. When points are marked the axes optimization will only regards these points. 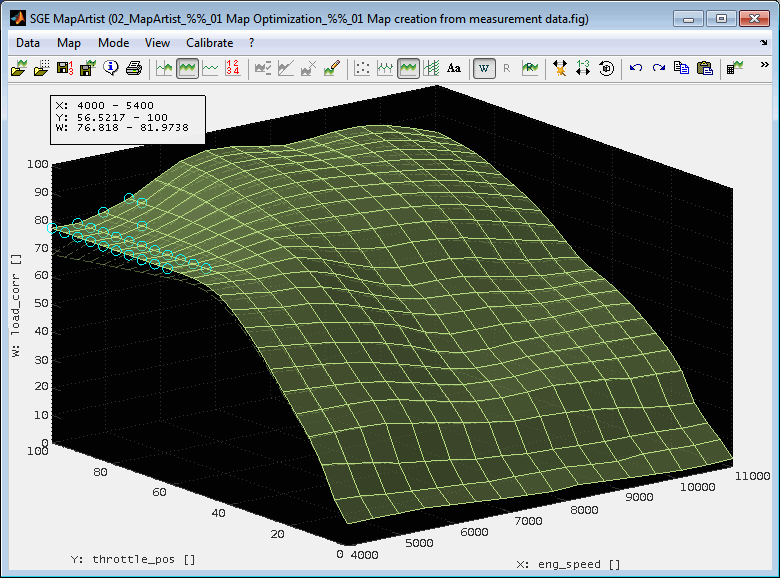 Therefore it is possible to optimize axes with focus on specific map regions. In general axis optimization is only reasonable if the data values are equally distributed. If the data was measured with discrete values only the axis optimization will fit the axes breakpoints to these data values. 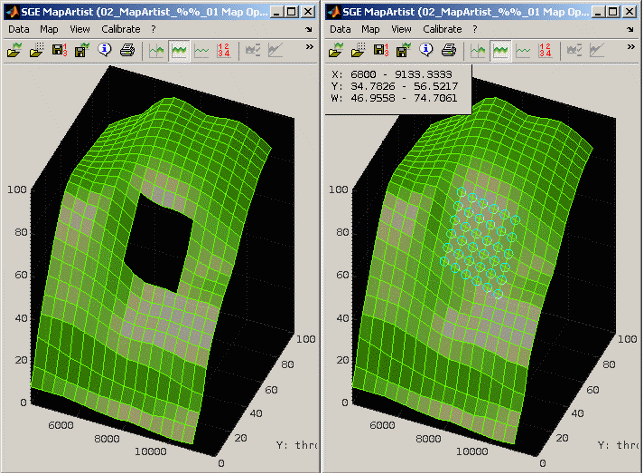 After axes optimization the map calculation should be repeated to again fit the map values to the data points. After creating a base map using the map optimization and smoothing features or loading a existing map you probably want to fine tune it manually or tool assisted using your experience and regarding the constraints given by the purpose of the map. To modify the map one or multiple points must be marked. All operations refer to the marked points only. Enter a numeric value or "n(an)" or a calculation. Values can be specified either directly or as a simple calculation rule. In the calculation rule, the placeholders "X", "Y", and "W" can be used to access the current values of the map or the axes. Additionally "XMAX", "XMIN", "YMAX", "YMIN", "WMAX" and "WMIN" can be used to access the extrema. = : Set to value (numeric or n[an]). + : Add value (also negative to subtract). * : Multiply with value. / : Divide by value. +% : Add relative value in percent. SetToReferencePage: Set to value of reference page of active map. SetInvalid : Set to invalid (NaN). Set to "label" : Set to value of another map. Interpolation will be done in case both maps have have different axes. Outside the axes range the interpolation will clip the last map value. Most of them are accessible via keyboard shortcuts and you can also increment/decrement using the mouse wheel. See the keyboard shortcut section for details. Especially using the keys for the digits and – allows to directly input a new value for the marked map points. When the error lines (and therefore the error calculation) are turned on and only one point is marked and modified, the color of the mark indicated the error trend. When it is green, the error was decreasing by the modification. When it is red, the error was increasing. 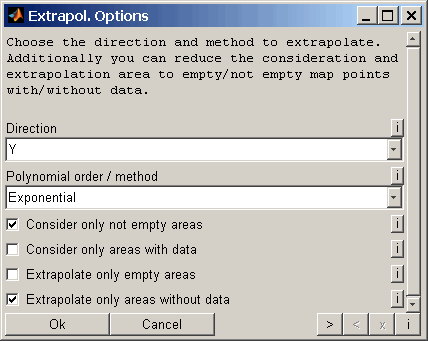 The axis values are modified you will be asked whether to adjust the map accordingly by interpolation or extrapolation. The decision can be remembered. In this case you will not be asked again until the software is restarted. Interpolation / extrapolation can only be performed when the axes are strictly monotonously increasing. You will be informed when this condition is not met. If you set points to invalid, they are filled with NaN (not a number) and made invisible. This creates holes in the map. Sometimes this is e.g. useful to not show border areas where no data points exist. You can not mark invalid points directly any more. To mark them you must mark areas around to include them or use a logical mark condition. To use a map in the ECU or to save it to calibration parameter file you must fill all invalid point with numerical values. You can do a linear interpolation of marked sections of the map in x or y direction (Shift + x / y). The border values of the section is kept and the intermediate values are interpolated. Similar to the extrapolation you can to a interpolation. Similar options are available. When doing polynomial, exponential fits or extrapolations the fitted curves are displayed as lines as well as the considered and modified points. To remove them you can recall the interpolation functions or reset the view. You can do an extrapolation of sections of the map (Ctrl + Shift + e). This is done using a two step procedure. First you mark a reference area and call the extrapolation function. 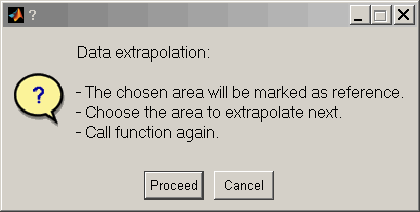 Then you mark the area to extrapolate and call the function again. Choose the direction to extrapolate in. In the reference area the map points are fitted by a polynomial or exponential curve in the chosen direction. The curve is then used to calculate the values in the extrapolation area. Choose the polynomial order or exponential method here. The maximum value depends on the size of marked area. You can reduce the map points to consider for the curve fit to the not empty (NaN) points or / and to the map points with data points nearby. This is useful as you can mark big areas but use only part of it for extrapolation. So you can easily extrapolate scraggy map bounds because you can mark a rectangular area but only consider the not empty part as reference. Similar to the consideration area you can also reduce the extrapolation area. Sometimes only parts of the map are modified and the changes should do a smooth transition to the neighborhood areas. Imagine you correct the full load breakpoint only but want the change transferred to the part load area with decreasing influence. Use the “Distribute changes” (Ctrl + Shift + x / y) function to achieve this. You need to mark the transition areas as well as the border of the changed are. The difference between the reference and working page at this border is then linearly distributed. In the following figure the cyan line is the reference page. The yellow one is the modified map - only one breakpoint is changed. After distributing the change the red line is created. If the map should agree with limitations regarding its gradient these restriction could be applied automatically (Ctrl + g). For example it could be necessary that a map is strictly monotonously increasing in x direction. Enter a scalar numeric value to use as the maximum gradient limit. Value may be positive as well as negative or zero. Leave empty to not restrict the max. gradient and set to "Min. gradient value" to force a fixed gradient. Enter a scalar numeric value to use as the minimum gradient limit. Value may be positive as well as negative or zero. Leave empty to not restrict the min. gradient and set to "Max. gradient value" to force a fixed gradient. The limit value entered above may be absolute or gradient. Absolute:The delta between neighbor label values will be limited directly. Gradient:The gradient between neighbor label values will be limited. Therefore the axes breakpoint distance is considered to calculate the gradient. Choose the direction to operate. If label points are marked, only the marked points are regarded. If selected empty areas will be filled. Otherwise empty areas will be skipped. 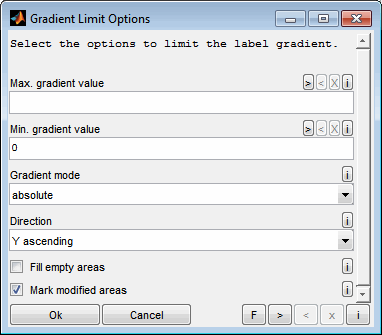 If selected the label areas modified due to gradient limiting will be marked. 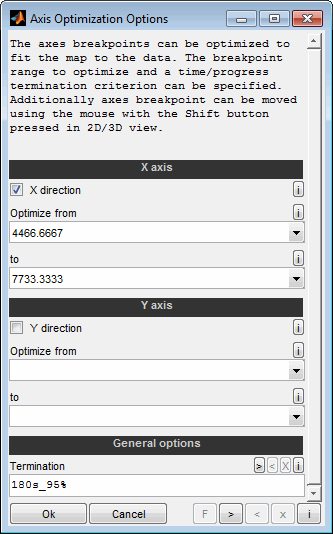 In addition to the automatic axis optimization in 3D view and the manual edit of axis points in table view you can directly drag axis breakpoints in 2D/3D view with the mouse while pressing the shift key (Shift + Mouse button). Make sure to have exactly one map point marked. Press the Shift button, click to the marked point and keep the mouse button pressed. Move the mouse once far away to the screen border to unsnap the axis point. Place the axis point as desired and release the mouse button. The axis pane and value are shown during modification. After releasing the mouse you will be asked to confirm the new value and if you want to interpolate / extrapolate the map to the new axis value. You can copy and paste parts of the map or the whole map using the clipboard (Ctrl + c / v, Shift + w). The format is suitable to paste into a spreadsheet software. Additionally entire maps with axes can be copied to clipboard using different target formats. See “Fehler: Referenz nicht gefunden” for details. Additionally you can load sessions and template data files by pasting them into a MapArtist session. Before you have to copy them directly to the clipboard or as strings containing the file names line by line. Using copy and paste in table view will always handle the map/axes values – even if the display mode is set to show e.g. differences. Using the extended paste mode (Ctrl + Shift + v) enables you to apply operations like addition, subtraction, multiplication, division or max/min selection when pasting the values. This can be used e.g. to add two maps. It is also possible to transpose or flip the data before pasting. 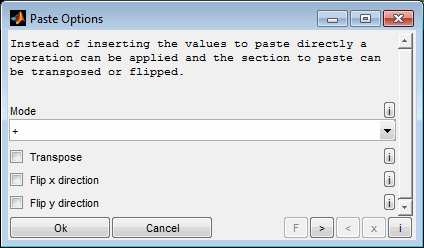 The decimal separator used for copy / paste actions can be set in the SGE Circus preferences – by default the operating system setting is used. You can set parts of the map or the whole map to the value(s) of the reference map (Ctrl + u). Usually a label is implemented in a ECU using computer data types and then calculated to physical values using a conversion formula. This may lead to a restriction of the value range and force a incrementation. To consider this while editing a label the conversion rules for the label and axes may be specified (Ctrl + k). Initially the values are set to the A2L values if available, e.g. if the label was retrieved from ETAS INCA software. The values are also remembered in relation to the label name in a database. 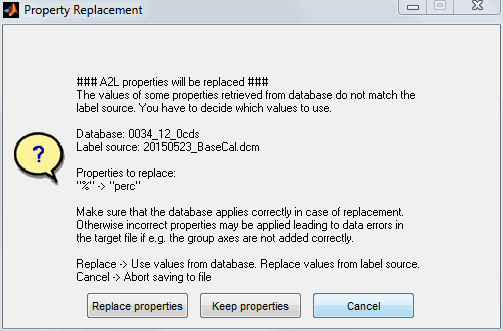 They will be retrieved from database again if you import a map from calibration parameter file or create a new label. Therefore it is important to enter the exact label name when creating a new label. You man enter values differing from the ECU conversion to ease manual map editing. But best practice is to keep the ECU conversion and use the manual editing increment gain setting to adjust to a suitable for manual incrementation and decremention. The conversion rule may be applied by manual invocation (Shift + k). When the corresponding option is enabled it will be applied automatically whenever the map is manipulated, e.g. after automatic map creation, smoothing, pasting and so on. When automatic application of the conversion is disabled the increments are just used for manual incrementation. All other map manipulations do not consider the conversion rule then. For manual map editing (incrementing, decrementing) in general the increment from the conversion rule is used. To adjust to the practical needs a gain factor can be set. The gain factor does not influence the conversion rule. It is just used for manual map editing. 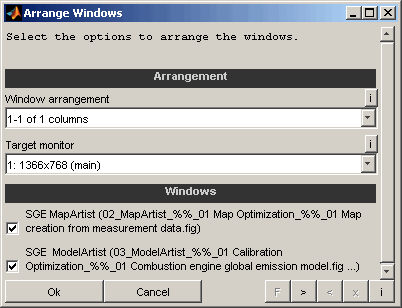 Besides the settings here the A2L conversion rules may be considered when saving the map to calibration parameter file or ETAS INCA software. 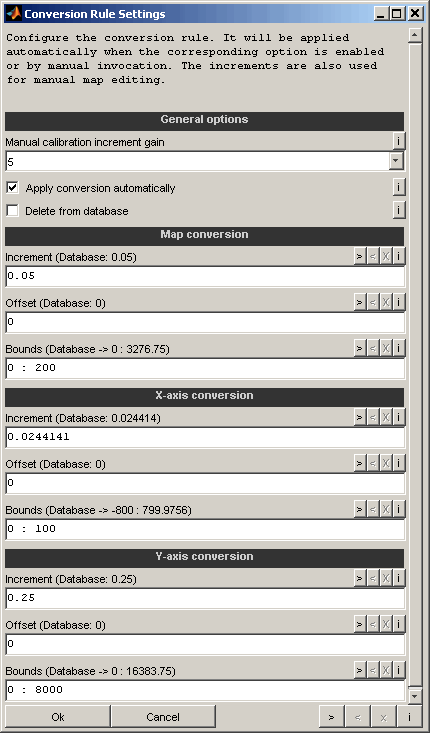 When enabled the conversion rule is applied automatically whenever the map is manipulated, e.g. after automatic map creation, smoothing, pasting and so on. If not enabled the conversion rule is only applied when invoked manually using the corresponding menu option (Shift + k). Besides the settings here the A2L conversion rules may be considered when saving the map to calibration parameter file or ETAS INCA software. If enabled the info for the actual label will be removed from database. This option may be used to remove incorrect or outdated data from database. If the database contains multiple entries for a label name only one will be deleted. The values will be forced to agree with the offset and increment if the conversion rule is applied. The increment does also influence the step used while editing the map manually. The values will be limited to the range entered if the conversion rule is applied. Specify scalar values separated by colon or spaces, e.g. 0 : 100 for a range from 0 to 100. Use inf/-inf for unlimited ranges, e.g. -inf : 100. Leave empty to not apply bounds. The whole session including data can be stored as file (Ctrl + Shift + s). After re-opening the whole functionality can be used again immediately. Session files can be opened the same way as data files or using the SGE Viewer. Session files may get very large as they contain the loaded data. Apart from saving a session it is possible to save maps to files and transfer datasets to ETAS INCA software, see section “Save maps“ for details. To be able to use the maps and data also for presentation purposes, the MapArtist makes it available to export the actual view into the clipboard or file formatted in a way that is suitable to be useful for different targets (Ctrl + Shift + c). This can be different sizes of clipboard content. "Email" and "Document" are specially sized to fit into a email or document software. Some paper formats are also available and all windows can be printed and saved to various file formats. The created window is configurable. So you can move elements like legend or cursor boxes. It is also possible to add lines, arrows, text boxes etc. to the window to explain or highlight. During creation some options will be asked to define the base layout of the window. After closing the window the content will be copied to clipboard and can be pasted / used in the target software. INCA is a registered trademark of ETAS GmbH, Stuttgart. Microsoft, Windows and Excel are either registered trademarks or trademarks of Microsoft Corporation in the United States and/or other countries. The SGE Circus includes Third Party Software. For details please refer to the → SGE Circus documentation.